For the answer to question 1, take a look at our Backcountry Skiing and Avalanche Safety post to help point you in the right direction. For the answer to question 2, please read on. Skiing in general is a gear-intensive activity, and it doesn't get any simpler in the backcountry. Rather, ski-touring takes the gear requirements up a notch. In addition to the requisites - skis, boots, poles, helmets, goggles, outerware, base layers, etc. - avalanche safety equipment is another essential item to the sport. At a minimum, safety equipment should include an avalanche beacon, probe, shovel, and a backpack to carry them. To add to that, the typical ski, boot and binding setup used for lift-served skiing doesn't do so well when you've got to power yourself uphill in order to get to the fun part, the descent. 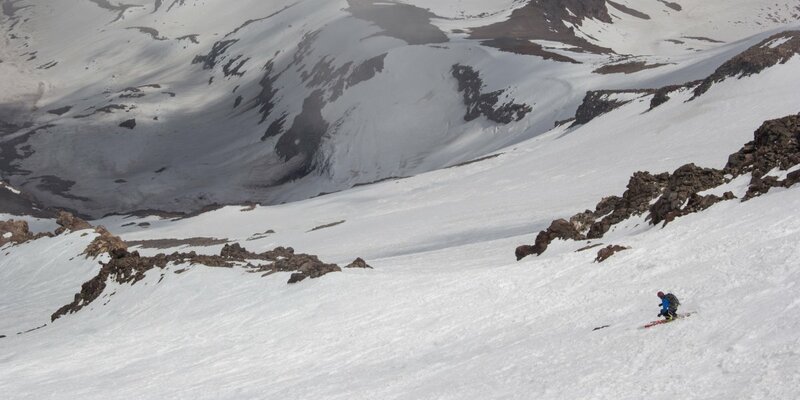 For the uphill, it's ideal to have lighter weight gear, including touring boots equipped with a "walk" mode, alpine-touring or AT bindings that allow the toe to remain mounted in the binding and the heel to lift free, climbing skins and adjustable poles. Lightweight skis don't hurt either. Most ski equipment manufacturers are now making ski-touring equipment specifically designed for the backcountry, which means there are a lot of choices out there. And then there's the more niche gear companies that focus on making the supporting safety equipment such as beacons or backpacks; again, lots of good choices. To help get you oriented with the type of gear you need, we've provided a list of the essentials and some of our favorites below. Backcountry skiing opens up a new playing field of uncrowded terrain. Photo by Reed Youngbar. It goes without saying, a reliable pair of skis are a critical piece to the backcountry equation. 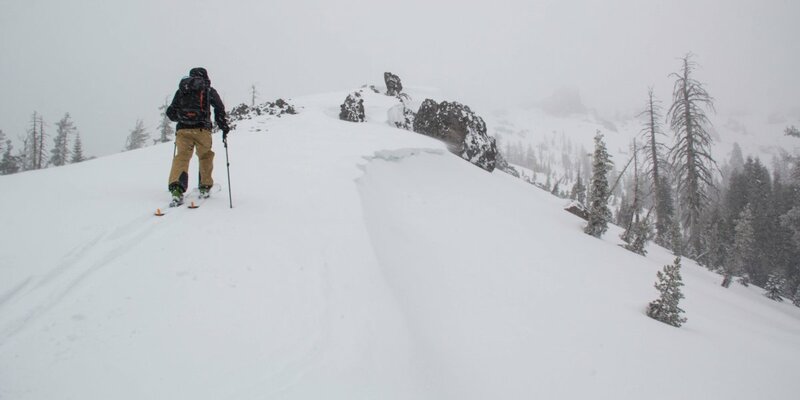 If you're just getting started it's wise to think about mounting a backcountry ski that can handle variable conditions well because varying conditions are, more often than not, what skiers encounter in the backcountry. If you dive deeper into the sport you may opt to build a ski quiver and have a couple of different types of skis for different conditions or terrain (a powder ski or a shorter couloir-oriented ski, for example), but that can come later. Selecting a ski that handles variable snow well is a good place to start. Weight is also a big factor. Fortunately, many ski manufacturers make a lighter weight model specifically for the backcountry. 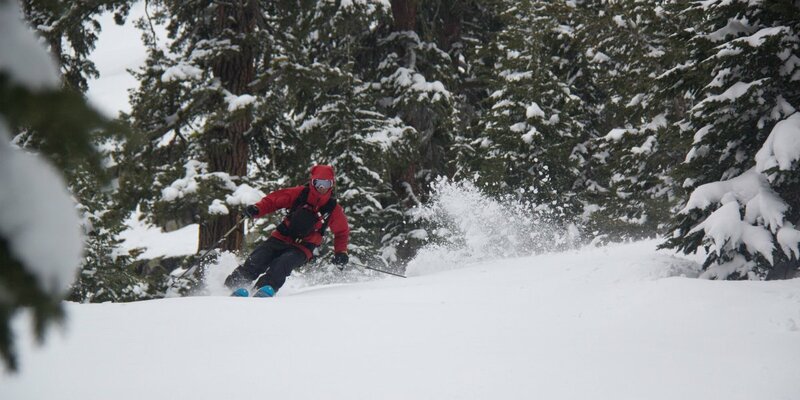 Skinning up the alpine in Sequoia National Park. Photo by Reed Youngbar. You won't get too far in the backcountry without a good pair of skins. Skins are a unidirectional fabric that attach to the base of skis allowing skiers to glide uphill and prevent slipping backwards. They adhere to the base of your skis with a long-lasting glue. Skins are offered in different weights and materials (e.g. nylon or mohair) and must either be cut to fit ski length and width or pre-puchased to fit ski dimensions. Some backcountry ski manufactures have designed skins and skis that only fit together with their proprietary attachment technology. Others are designed to fit all types of skis. There are two main types of ski touring/AT bindings on the market: tech bindings and the more traditional alpine binding constructed with an AT walk mode enabling a free heel. Tech bindings are quickly becoming increasingly popular due to their reduced material bulk and improvements in durability and performance, and these are our recommended choice. 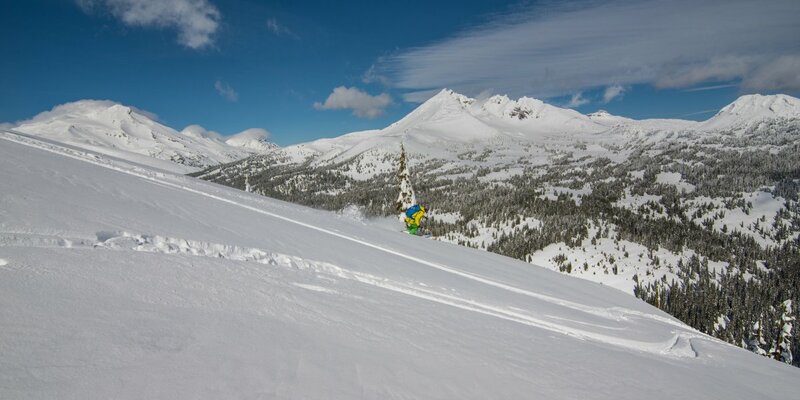 If you are primarily resort skiing with a sidecountry or backcountry day here and there, the more traditional alpine AT binding can work well and will provide that familiar binding feel. However, if you are aiming to ski more than a couple of days in the backcountry and you picked up a pair of lightweight touring skis, you'll want to go with a tech binding or tech-hybrid model to avoid undermining the weight reduction. Fortunately there seem to be increasing numbers of well-made tech bindings released each year along with a trend in performance improvement. 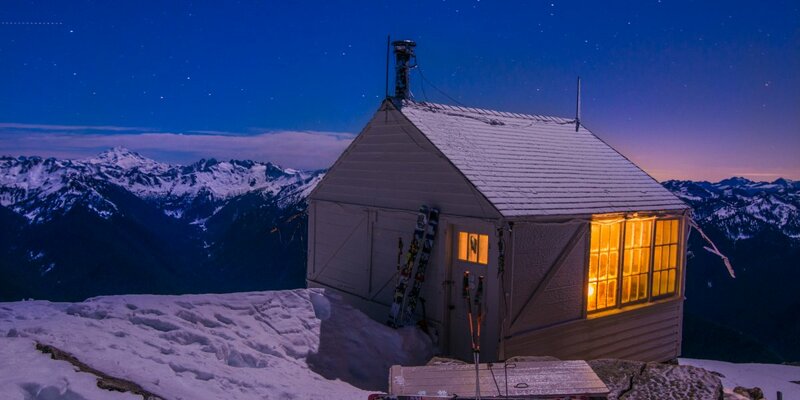 Who wouldn't want to stay in a cozy hut like this in the North Cascades? The catch is you'll have to work hard for it. Photo by Benjamin Krause. Ski boots designed for the backcountry have a few key differences from traditional downhill boots. First, they have both walk and ski mode functionality. Walk mode allows the cuff to pivot, making it easier to glide uphill and reducing the strain on the legs, knees and ankles caused by walking in rigid cuff boots. Second, they have toe and heel pieces and associated sole plates that work with both tech and alpine binding models (some come with interchangeable plates). Finally, they are lighter than traditional ski boots. Comfort may be the most important factor in choosing a pair of AT ski boots, even more so than with traditional downhill boots, since you will likely be spending multiple hours hoofing uphill on your feet. Make sure to try on the boots before purchasing. There are multiple flex options available on the market, but generally you won't get the same stiffness out of a 130 flex AT ski boot as you would out of a 130 flex downhill boot. Adjustable poles are helpful in the backcountry for traversing and steep ascents, but other than that, you can't go too wrong with pole selection. Larger powder baskets are important, and with weight always a factor, there are some nice carbon options available. Poles that double as probes sound nice, but in reality it's a safer option to have a separate probe. Fresh tracks in the Central Oregon Cascades. Photo by Benjamin Krause. Probes are second part of the avalanche safety equipment trio and critical to finding buried avalanche victims following a fine search with a beacon. Length is a consideration; we recommend sticking in the 260-300 mm length range. Shovels are the third piece to the avalanche safety equipment trio must-haves and are critical to getting to avalanche buried victims. Shovels also come in handy in making snow shelters or leveling a step on steep inclines to click into skis. While weight is important, having a durable, reliable shovel blade is paramount. Stick to the metal blade options, period. Weather changes quickly in the mountains. Be prepared for inclement weather when out on a tour. Photo by Reed Youngbar. 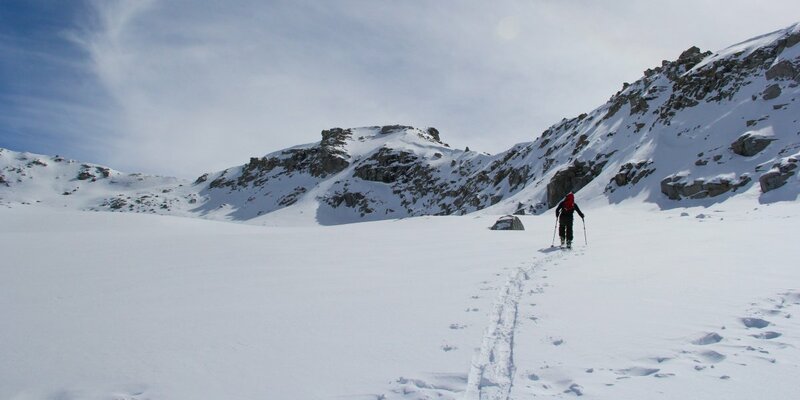 Ski touring backpacks are essential for carrying layers, food, water and avalanche safety gear. These packs are designed with an easy access outer pocket for carrying a shovel and probe. The size of the pack depends on the length of ski touring you're doing, but for half to full-day tours, you can typically work with a 30 liter or smaller pack. Multi-day tours require much larger packs. In recent years, avalanche airbag backpacks have gained popularity as another piece of gear enhancing safety in for winter backcountry travelers. Airbags aren't necessarily a must-have item, and some perceive them as encouraging a false sense of safety. Regardless, when they are deployed in an avalanche scenario the stats suggest they help save lives. As if there wasn't enough already! In all seriousness, there are a few other gear considerations for backcountry skiing worth mentioning. Clothing is often similar to what you would wear at the resort (assuming there's no cotton in your ski wardrobe), but leans more heavily on strategic layering with a base layer, mid-layer insulation and soft or hard shell depending on the weather and climate. As long as you aren't in a heavy wet Cascade snowstorm, soft shell outerware is preferred by many for its breathability. Bring two pair of gloves for keeping your hands dry when digging pits (part of the training mentioned at the beginning of this article). Speaking of pits, a snow saw and an AIARE fieldbook are incredibly useful items to have - items that are put into context in taking an AIARE approved avalanche safety course. Make sure to have plenty of food and water as you'll need to keep the calories coming in and staying hydrated. Water bladders work well in most modern ski packs as long as your hose is insulated from freezing in cold temperatures. Bring plenty of sunscreen and a small first aid kit and know how to navigate in the wilderness using map, compass, GPS (and in white out conditions should they occur!) if your ski tours take you far from the road or resort. Most importantly, gear without the knowledge to use it can get you into trouble. If you're just getting into the sport, make sure to take an avalanche course and head out with folks that have local terrain knowledge and backcountry skiing experience. Experience, knowledge and informed and safe decision making are the means to a long-lasting and healthy relationship with the winter backcountry. Descending Shasta's Wintun Glacier. Photo by Aron Bosworth. Great job on the post. It reminded me though that I have some friends here in Utah who are changing the way we travel in the backcountry. They recently raised almost $40,000 on Kickstarter and have a really innovative product. I'm sure readers would love to hear about it if they are really serious about getting into the backcountry.